FoldingSetImpl - An implementation detail that lets us share code between FoldingSet and ContextualFoldingSet. Definition at line 400 of file FoldingSet.h. Definition at line 420 of file FoldingSet.h. Definition at line 415 of file FoldingSet.h. Definition at line 410 of file FoldingSet.h. Definition at line 402 of file FoldingSet.h. Definition at line 412 of file FoldingSet.h. Definition at line 417 of file FoldingSet.h. Definition at line 422 of file FoldingSet.h. Definition at line 426 of file FoldingSet.h. Definition at line 413 of file FoldingSet.h. Definition at line 418 of file FoldingSet.h. Definition at line 444 of file FoldingSet.h. 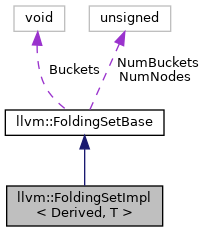 Referenced by llvm::FoldingSetVector< T, VectorT >::FindNodeOrInsertPos(), llvm::RecordRecTy::get(), llvm::BitsInit::get(), llvm::ListInit::get(), llvm::UnOpInit::get(), llvm::BinOpInit::get(), llvm::TernOpInit::get(), llvm::IsAOpInit::get(), llvm::VarDefInit::get(), and llvm::DagInit::get(). Definition at line 437 of file FoldingSet.h. 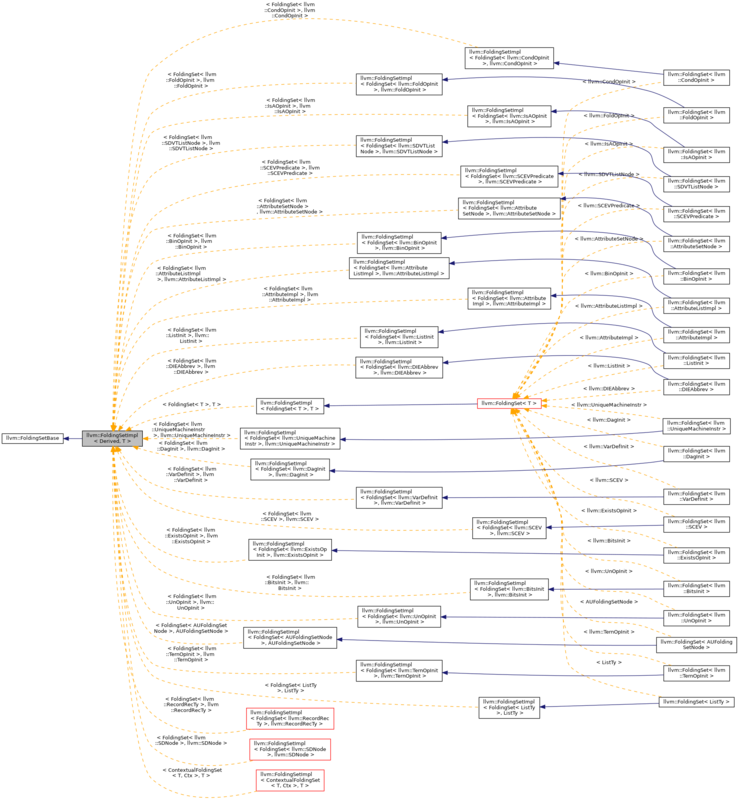 Referenced by llvm::FoldingSetVector< T, VectorT >::GetOrInsertNode(). Definition at line 451 of file FoldingSet.h. Referenced by llvm::RecordRecTy::get(), llvm::BitsInit::get(), llvm::ListInit::get(), llvm::UnOpInit::get(), llvm::BinOpInit::get(), llvm::TernOpInit::get(), llvm::IsAOpInit::get(), llvm::VarDefInit::get(), llvm::DagInit::get(), llvm::SelectionDAG::getTargetMemSDNode(), and llvm::FoldingSetVector< T, VectorT >::InsertNode(). Definition at line 457 of file FoldingSet.h. Definition at line 432 of file FoldingSet.h.